When you think of floor graphics, you might automatically think of giant icons or logos in governmental buildings. No doubt you’ve seen the famous CIA logo in pictures or in person while visiting Washington, D.C. However, many businesses and retail stores are turning to floor graphics as a way to advertise. Here at Revolution Wraps, it’s become one of our popular graphics options for reasons that frequently go into the realm of customer psychology. Nevertheless, floor graphics have many practical uses in providing an affordable way to advertise your company. You also have options of making them either permanent or temporary based on the material you use. We have many clients who simply want floor graphics to promote a product or upcoming events. In this instance, vinyl floor graphics are ideal because they can easily be placed on the floor, then quickly removed thanks to a convenient adhesive. With this option, you can promote events, sales, or advertise your product in a different way from the usual. The psychological angle comes in capturing customers who don’t bother to look up at high-hanging advertisements. In an age where everyone has their head pointed down at their phones or with other distractions, floor graphics capture the eye of these people. 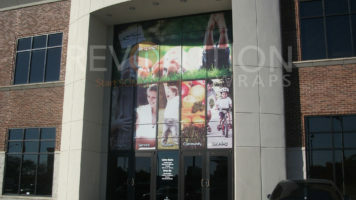 What makes vinyl additionally great is the ability to make graphics pop out. You can create a giant image of a product you’re selling and apply it to the floor of your store lobby. Plus, if you’re holding an upcoming sale or event, promoting it with big bold letters on the floor guarantees being noticed. Most people are still used to seeing store advertising up on walls or on free-standing signs. By using floor graphics for promotion, you’ve taken a step forward in being different from your competitors. Another psychological angle floor graphics provide is in helping customers find a product or section of your store. Since many people are looking down anyway, using laminate or vinyl floor graphics with arrows or footprints gives a psychological pull to follow where those graphics lead. We’ve had many clients use this method, and it never fails in leading customers to a favored part of the store. When you want people to check out a new product, using floor graphics with directions is one of the best and most affordable advertising methods around. Even in a regular company where you want visitors to find specific departments, floor graphics are a unique way of leading people to the right places. It also helps those who get confused reading myriad directions on a directory in a lobby. By simply providing text or arrows, those people get led to the appropriate section, department, or floor directly. With various options available on materials and application methods, floor graphics provide aesthetic class to your business. Thanks to our digital printing methods, images pop out almost like 3D with vivid colors. Floor graphics can also be applied in any shape you need. All materials are slip-resistant so you never have to worry about someone slipping and falling. You’ll also discover how durable the materials are so heavy foot traffic over your floor graphics never becomes a problem. In the chance you make your floor graphics permanent, you can keep them there for years without worry of them looking worn. With vinyl, easy removal means you can update your floor graphics regularly when you have seasonal sales. Once removed, the materials never leave residue on your floors. 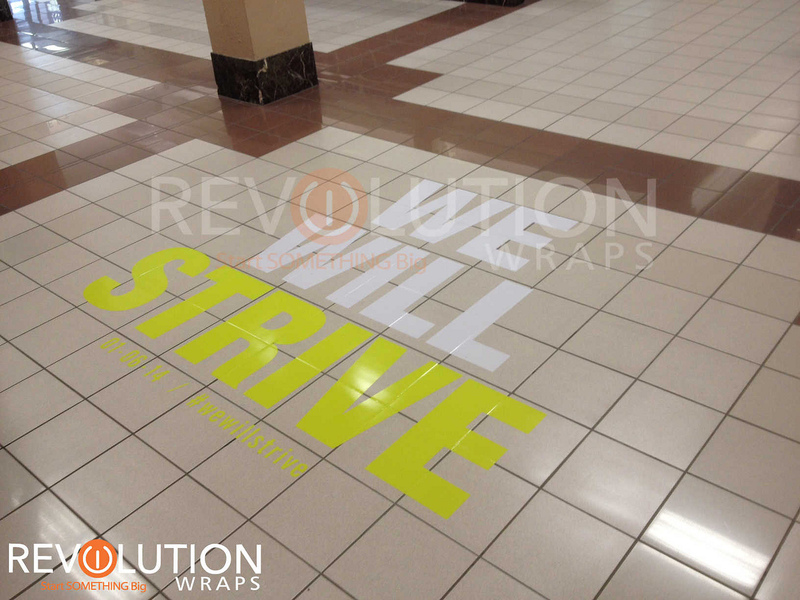 Let us help you create some memorable floor graphics for your business here at Revolution Wraps. Contact us and we’ll show you our portfolio of past work for others so you can get an idea of the different options you have.